Above ground or below, let Modern Plumbing control the flow! We pump tanks, clean drains and repair sewers throughout the Raleigh area. Consider Modern Plumbing & Backflow your one-stop resource whenever you need sewer or drain plumbing services. Offering a skilled, local team, competitive pricing and quick, reliable service, we’re the sewer and drain specialists you can rely on. From clogged drains and rooter services to hydro-jetting and pipe repair, Modern Plumbing & Backflow is here to help. We provide sewer inspections, drain cleaning, pipe maintenance and more. Clogged drains can really be a headache. Don’t deal with one on your own — call in the experts! Our Raleigh plumbers offer rooter services and drain cleaning to fix the problem quickly and let you get back to your day. 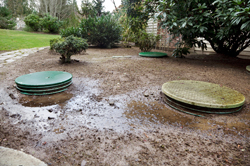 If you’ve noticed a sewage smell on your property or consistently wet patches in your yard, it’s probably time for a sewer line repair. Modern Plumbing & Backflow provides skilled repairs and replacements to ensure that your plumbing does its job the way it was designed to. Mysterious plumbing failure? With the latest video camera equipment, Modern Plumbing can see inside your drains or sewer line to pinpoint the problem. Once we’ve zeroed in on the crack or clog, we’ll recommend a course of action and provide an effective solution. Call to Schedule a Drain Cleaning or Sewer Inspection Today! Based in Raleigh, NC, our experienced plumbers serve serve homeowners in Raleigh, Durham, Chapel Hill, Cary, Clayton, Wake Forest, Holly Springs, Salem, Burlington, High Point and the surrounding areas. "These guys came out and helped me out after another company nearly flooded my house. I should have called Modern Plumbing first. Thanks for the help and coming out after hours on a Sunday. I will recommend you!"